This summer hasn't been a restful one at the Knitty head office. It's not that I expected it to be, but there's something about summer that suggests lazy days and relaxing somewhere outdoors. Not so much this year. Except I'm not complaining. Because this summer, my programmer [also, conveniently, my husband] and I were finally able to do something that we've wanted to do for a long time. And you've probably wanted it longer than we have. Please sit down. This may come as a shock. Starting with this issue, Knitty patterns and articles are printer friendly. If you select PRINT from your computer's menu, a printer-friendly version of the page will be printed including all pictures, charts and schematics -- that's the default setting. There are also two new buttons at the top right of each content page to give you a little more control over how much ink and paper you use. Click this button and the printer window will automatically appear, allowing you to print the full printer-friendly page. Click this button and the printer window will automatically appear, allowing you to print the printer-friendly page with just the first picture, all charts and schematics. Not sure which version you want to print? Click one of the buttons on a pattern and select PREVIEW in the printer window. It will display what will print before you actually use up your paper and ink. Multi-item review pages like Cool Stuff, Fiber Fiesta and Yarn Roundtable don't have the 2nd option. You might wonder what took us so long. Well, we were hoping to find an all-encompassing solution that would fix the whole site -- six years worth of great knitting patterns and articles worth printing -- all at once. We came to the realization that it wasn't going to happen. Instead, we've started with this issue, and will be working backwards in the archives until our whole catalog is upgraded. If the "printer friendly" note isn't below the heading, then we haven't gotten to that issue yet. For those pages, should you have trouble fitting everything on the page, select LANDSCAPE mode and print that way. Have your printouts been stopping after one or two pages? Check to see if you've got "shrink to fit page" selected in the printer window (before you click PREVIEW or PRINT) -- if you do, deselect it. The shrinking process seems to prevent patterns printing as soon as it hits a big image, very often a chart, which happens around page 1 or 2. Now, you guys know that when you're dealing with code, sometimes things can get messed up despite all best intentions to the contrary. So please consider this issue our beta launch of printer friendliness, and yourselves our huge army of beta testers. If you find something that doesn't work properly [a button doesn't work, or a page wants to print all images when you've selected the print main pic only option], please email me with details and I'll get it fixed asap. Happy 6th birthday, Knitty readers. We love you. The Knitty Calendar Contest is over and here is the result! To read more about the winners, and see the honorable mention gallery, visit the Knitty blog. 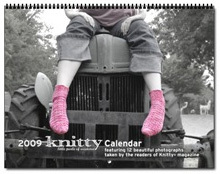 The calendar is now available for purchase in the Knittyshop. Speaking of the Knittyshop, we figured it was time for some new shwag. There are fresh-new Knittyspin shirts and a new Knitty design, too. Go forth! Buy shwag! Cover yourself with Knitty love! To always know the latest Knittynews, sign up for the free Knitty reader list! The list is never shared with anyone and we only send out a few messages a year. We know our internet manners. Oh, there's one other rather big change: this fall marks the official launch of our little-sister publication, Knittyspin. Yup, Knittyspin has been around for quite a while, but it's now easier to get at through its own url -- knittyspin.com. It has its own cover and its own index, and we think it's about time. Is Knittyspin totally new to you? No worries. Just peek in our Archive. All Knittyspin content is archived separately -- patterns, features, and my Knittyspin column. Read more about this from Knittyspin's editor, Jillian. Fall is almost everyone’s favorite fiber season. The weather starts to chill, fiber shows come fast and furious as the season winds to a close, we do the last of our outdoor dyeing, and we (I) hoard fiber in case there’s a snowstorm so big that I can’t leave the house for several years. Fall is back to school time, too. I still want new school supplies and I have an unending desire to learn new things. Fall this year, for me, is about change. Instead of just taking classes, I’m going to teach as many people as I can to spin. I want to add to our community. I’m taking an extra spindle (or 2) and fiber with me when I go out to spin. 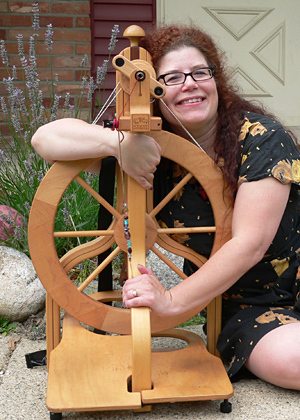 When I see that look -- that glassy, hypnotized, head slightly circling to the rhythm of the spindle look -- I’ll put a spindle and fiber in her hands, and create a new spinner. It’s how change happens, it’s how community is created, it’s how spinning has always worked, side by side and hand to hand. We’re launched with our own front page! Type Knittyspin.com into your browser and you’ll fly to the Knittyspin front page, where it's all spinning, all the time. Like our spinning community, Knittyspin is growing. Knittyspin will be adding more articles and patterns (and like big sister Knitty, archiving the old so it’s all easy to find) with every issue, let me know what you’d like to see in Knittyspin. Happy spinning and knitting! We have t-shirts! Check out the new Knittyspin t-shirts. They’re cool, they’re sheepy! Want to see them in person? Amy and I will be wearing them when we’re out and about at Rhinebeck. Spinning & Weaving Week is October 4–10, 2008. Be on the lookout for special events local shops and guilds have planned. If you have fiber, spindles, books, or other spinny products or tools that you'd like us to review, write me for submission information.